The future of coal mining in Colorado appears to be based on one simple principle – the government will demand extortion in some form before allowing companies to operate. 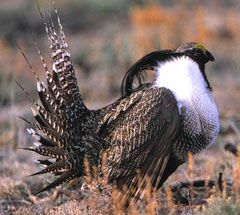 In the case of the Colowyo Coal Company, it appears that the bribe for allowing the miners to move forward with the Collum project to extract five million tons of coal annually, is for the company to “donate” 4,500 acres of land plus $150,000 to the state for the protection of the sage grouse. This would be one of those little modifications the federal government is allowing under the new moratorium on leases, while the feds conduct a three-year study aimed at banning future coal leases on public lands that we told you about. Tri-State, which owns Colowyo Mining Co., said Monday that the federal Office of Surface Mining Reclamation and Enforcement is scheduled to release a draft environmental assessment for the Collom project today. Stay tuned to see whether the exchange will be acceptable to Uncle Obama.